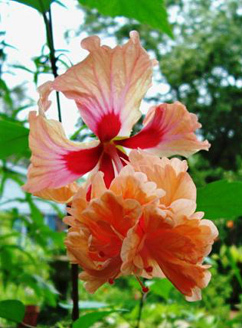 Originating in Asia and the Pacific Islands, Hibiscus rosa-sinensis is the national flower of Malaysia. It is closely associated with Hawaii, however the state flower of Hawaii is a native species of hibiscus, H. brackenridgei. There are many colors of hibiscus with various size blossoms. 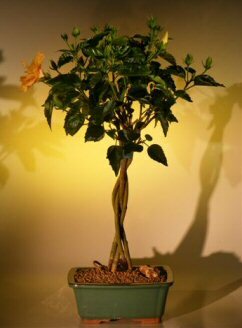 Our hibiscus are trained with braided trunks and have 2" diameter orange colored blossoms which appear during spring, summer and fall and even during the winter if kept sufficiently warm.